I need your expert input/advice regarding borders for this quilt top I'm working on. The pattern calls for a narrow (1-inch) border and then a wider (6-inch) border. The pattern photo shows a striped fabric for the narrow border and a large/busy floral for the wider border. I have 1/2 yard of the dark blue fabric left over but only small scraps of the others. Originally I bought this fabric for another quilt pattern but it has been in my to-do pile for so long that I no longer liked the pattern (that tells you how many years it sat around...LOL). I'm tempted to use the dark blue fabric for the narrow border but wonder if it will mess up the design where it connects to the same color in the main center design. I've also thought about using a plaid fabric for the 6-inch border. If this was your quilt, what would you do? The second photo attached is a close up of the fabrics if that helps. Any and all suggestions/opinions would be appreciated. Thanks. 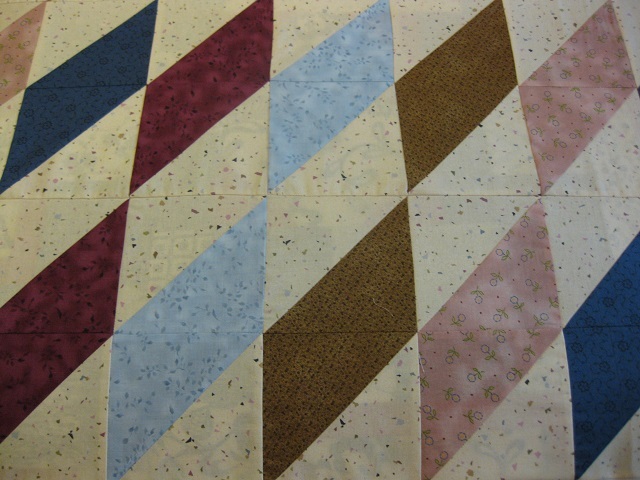 I would do a thin border with one of the darker colors to stop the motion of the quilt. Then, a wider final border with a graphic print that Incorporates many of the colors. Last edited by alikat110; 07-21-2013 at 04:43 PM. I would do a thin border with one of the darker colors to stop the motion of the qut. Then, a wider final border with a graphic print that Incorporates many of the colors. if you like a skinny inner blue border, go for it. I know what you mean about it touching some blocks but really in the big scheme of things, it doesn't matter. I do like striped binding sometimes. Great quilt!! This sort of pattern would look great with a thin border or just binding. I love it! Perhaps a narrow border of a cream fabric and then the dark blue narrow border would give you the separation you want. I also would avoid a floral on your wide border. I agree with ArtsyOne, lovely quilt. I really don't think that every quilt needs a border. Yours would be lovely with - or without. 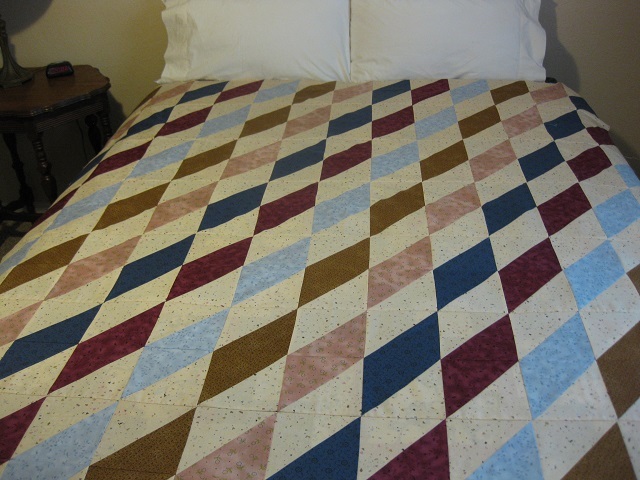 I would base the decision on whether you want the quilt to be bigger or not. I think your quilt is perfect as is too... unless of course, you need it to be bigger. I would avoid floral also, I think it would spoil the geometric appearance. Do you possibly have a blue similar, but maybe just a bit darker for the binding? If not, I think I like your idea of using the blue you have anyway. if you have lots of scraps left, maybe you could do a smallish light border and then another border with rectangles separated by your light fabric, then another small light border and your binding. If it were mine, I would bind it in the dark blue, if there's enough, and skip the borders altogether. With this pattern, you don't want to stop the motion. Beautiful quilt, would be nice either way, I agree no flowers. Beautiful quilt top. Finish however you want. Sorry I can't help about the border, but I think that the navy would be fine as a skinny inner border even if it touches the navy on the main part of the quilt. Either way, I like the effect of the quilt! It's great. Thanks for letting us see it. I wouldn't do a border. I agree with you on the thin border of the cream and then the dark color border. I think that would definitely give you the separation. I think your quilt is wonderful and I love your fabric choices! IMHO, this would be a great quilt to skip the borders on, unless, as others have said, you need to add size. I too, would bind with the dk. blue and be done. I agree with the artsyone. A narrow boarder of solid cream and dark blue would be great. No floral or busy fabric would distract from quilt. Great quilt. Thank you to everyone who responded. I love this forum! I've decided to go with the majority and just finish it off without adding any additional borders and use the dark blue fabric for binding. It will still fit a queen size bed without adding borders so that works for me. Again, thank you all so much! A large scale floral border would look great *if* it picked up all the colors in the top. Otherwise it'll just look like something you stuck on there to make it bigger. Since you don't have the perfect floral border, I would just put a narrow border on to stabilize the edges and then bind with the same color as the border or a scrap binding. I like quilts without borders because my mom never used them. She just made enough blocks to cover the bed and called it done usually wrapping the back to the front. She quilted out of necessity for warmth. Love this quilt! Really beautiful! It's going on my to-do list! I'd use the dark blue as the narrow border and then find a broad or irregular stripe or graphic, as alikat110 suggested, for the 6 inch border -- with the colors in the quilt, of course. Great quilt. I would go with the darker blue and a geometric, maybe plaid border.